The good news is that they’re really easy to understand and it will only take 2 minutes of your time to get to grips with. 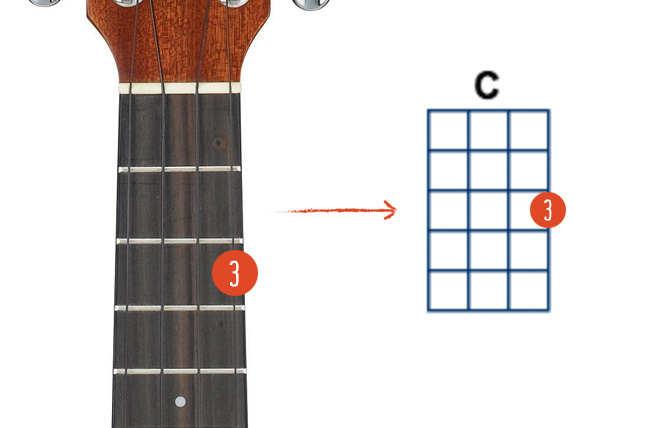 The diagrams relate directly to your ukulele and once you understand that, you’re good to go. Look at the image above. The chord box on the right is showing you how to play a C chord. 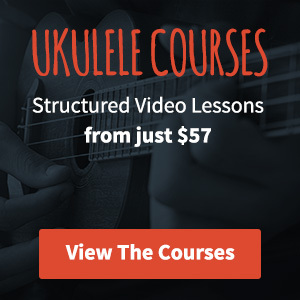 If you hold your ukulele upright then you will see the similarities to the diagram. The vertical lines relate to your strings and the horizontal lines to the frets. The chord box is showing a marker with a number 3 inside it on the first string (A string) at the third fret. The number 3 relates to the third finger on your left hand and although you could play this chord with any finger of your choice, it makes sense to use the third finger as it allows for an easier transition into another chord. That’s it, it’s really easy once you know how. Not all chord boxes will indicate which finger you should be using and it’s usually better to work it out yourself anyway depending on the way the chords are stacked up in the song you’re working on. Now go check out some songs! What about when the same finger is listed on several different strings in the chord box picture? For example, the B chord in your major chords list – it has “1” shown on every string. Thanks for commenting – ok when it comes to a chord like B you’re actually playing a barre chord. Your first finger is used to press down all the strings at the same fret. These are quite tricky if you’re new to them and I’m working on a post that will go a bit more in depth and explain some techniques to help get to grips with barre chords.